Authentic Cantonese cuisine at The Peninsula Paris. 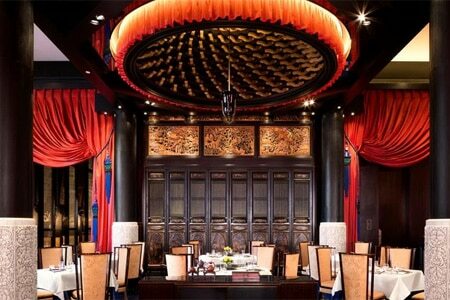 : LiLi, one of the dining options at The Peninsula Paris, presents authentic Cantonese cuisine from chef Tang Chi Keung. The dramatic setting, inspired by Chinese and French opera, features theatrical red curtains and cobalt blue chandeliers. Well-groomed service staff pays attention to every detail, presenting the dishes with a perfect diction. Expect dim sum wrapped in a delicate rice flour skin and stuffed with fresh ingredients such as shrimps, mushrooms and vegetables. The lunch menu at €68 also includes lacquered pork and roasted duck magret with sautéed rice and a palatable dessert, mango cream with grapefruit and sago pearls. Beware of the stiff prices, notably the espresso coffee at €8. Exhaustive wine list with a couple dozen sakés.